Food moves the world. For many, together with access to clean water, food security is their main concern. This makes agriculture one of the key economic activities in the world. 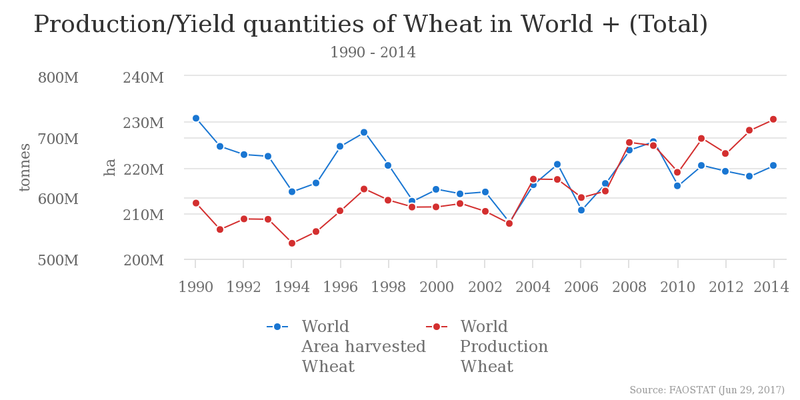 The agricultural production isn't concentrated in some areas of the world. Most of the countries have important aggregate outputs in several agricultural products (Data updated in 2017). Rice (paddy): in 2014 China produced 206 million tons (MT) of rice, India 157MT, Indonesia 70MT, Bangladesh 52MT, and Vietnam 44MT. In 2014 Asia produced 90.8% of the world's rice. Wheat: in 2014 China produced 126MT, India 95MT, Russia 59MT, US 55MT, and France 38MT. By region, Asia produced 43.9%, Europe 34.3%, Americas 14.8%, Africa 3.6%, and Oceania 3.5%. Maize: In 2014 the US produced 264MT of maize, China 138MT, Brazil 43MT, Mexico 19MT, and Argentina 16MT. 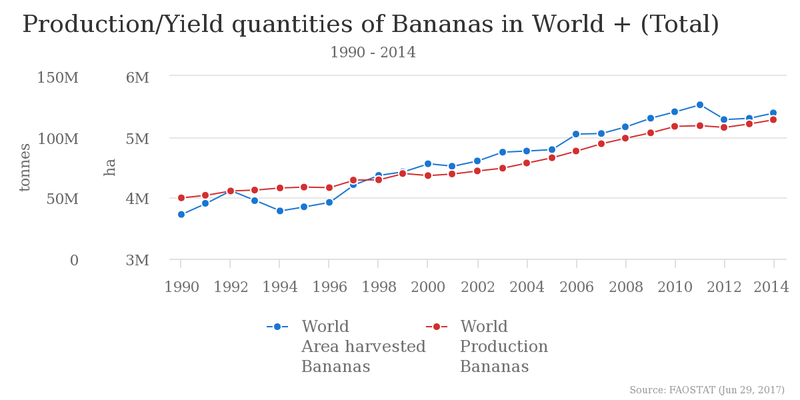 Bananas: The banana production is led by far by the India, in 2014 the country produced 29MT. 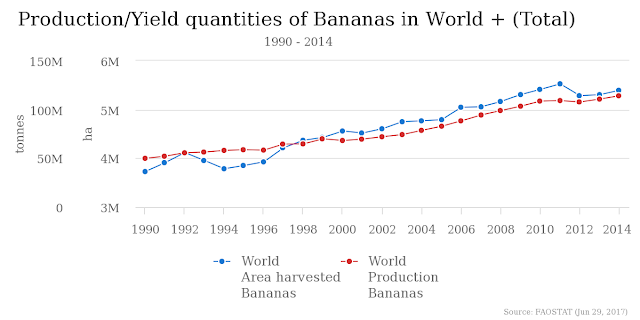 Others important producers are China (11.7MT), Philippines (8.8MT), Brazil (6.9MT), and Indonesia (5.9MT). Apples: in 2014, China produced 40MT of apples, US 5MT, Poland 3MT, India 2.4MT, and Turkey 2.4MT. Mangoes: India is the biggest producer of mangoes in the world (18MT in 2014), followed by China (4.5MT), Thailand (3.5MT), Indonesia (2.4MT), and Mexico (1.7MT). Oranges: The biggest producers of oranges are Brazil (16MT), China (7.8MT), India (7.3MT), US (6.1MT), and Mexico (4.5MT). 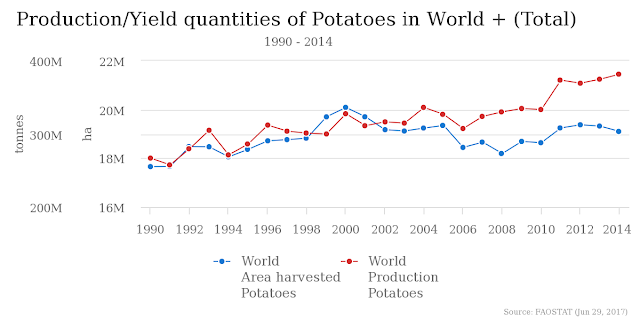 Potatoes: the biggest producers of potatoes are China (95MT), India (46MT), Russia (31MT), Ukraine (23MT), and US (20MT). Carrots and turnips: by far the biggest producer is China with 17MT. Other big producers are Uzbekistan (1.7MT), Russia (1.6MT), and US (1.4MT). Biggest agricultural producers in the world. Biggest cereal producers in the world. Biggest fruit producers in the world. Biggest vegetable producers in the world.